Red Cup Cafe | ohdenny. Gourmet Girl in Blackburn is a tiny little restaurant in Laburnum/Blackburn, situated close to Laburnum Train Station. Frequented by many of the locals, and it certainly piques my interest. 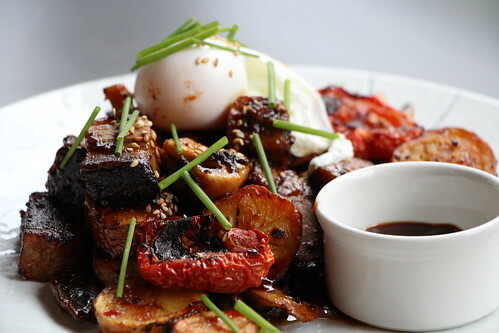 Gourmet Girl by day serves your typical breakfast, brunch/lunch affair. Toasted sandwiches and Focaccias, salads, wraps, pies and pastries as well as a wide selection for breakfast such as pancakes, eggs, muffins, toast and of course your big breakfast. Variety is there and it’s certainly its strong suit and of course they serve your typical hot and cold beverages as well. By night they have a tapas menu with wine for an enjoyable evening out. 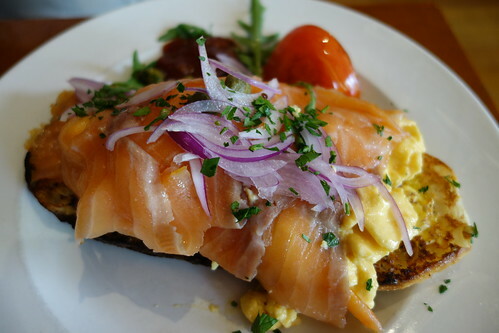 We ordered the Smoked Salmon topped with red onions, and served with scrambled egg with toast and a side of greens and tomatoes. It certainly looked inviting, the smoked salmon had a nice smokey flavour to the fish, but not over powering. The scrambled eggs however were on the bland side, and lacked any sort of pepper or salt seasoning. 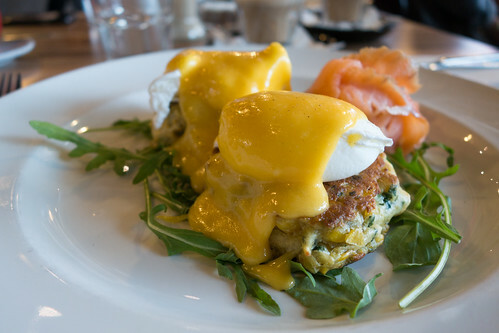 However, I guess the saltiness from the salmon is supposed to carry the dish so you are not overloaded with salt, but unfortunately the eggs did not have any richness to it, nor did it taste like eggs. It was honestly disappointing. The bread was also leaning on over toasted as well (the edges are slightly dark brown) and almost had a burnt taste to it. Care and attention to detail is key and it’s what made this a real letdown. 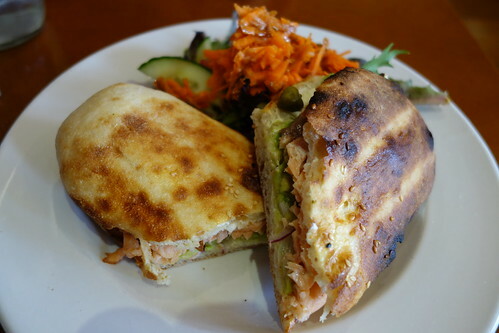 The “Canadian” Focaccia that we ordered was also a Smoked Salmon dish with cream cheese, capers, red onions, avocado spread and mayonnaise served with a lightly dressed garden salad. Again you can see it was burnt on several parts of the bread, definitely over toasted. The bottom of the Focaccia was also visibly dark brown unfortunately. Flavour wise (apart from the burnt-ness), was decent. Although, on this occasion too salty. The capers and smoked salmon add the saltiness but there is nothing there to really balance it as you also have the richness of the mayonnaise and cream cheese. The avocado attempts to provide a milder flavour to the dish but the avocados here also lack fragrance. The garden salad was basically a small pile of rocket and sliced cucumber with a huge chunk of grated carrot, with a generous drizzling of dressing. Presentation is not their strong suit. Again, I was not impressed with how this was served, lacking in any consideration and served blackened that definitely should not have gone out in any decent cafe. Gourmet Girl, leaves a bad taste both literally and metaphorically in my mouth. The customer service at Gourmet Girl was one of the bad experiences I’ve had to sit through. They forgot one of our orders (which was served to another table that came after us), which I admit can happen when its busy and I do understand. When we finally received our order after more than half an hour of waiting, what we received was above, a charred sandwich (as mentioned above). The kicker, no apologies made when they informed us of their mistake nor when actually providing the dish to us. They even asked if we would like to order drinks (to pay for) while we are forced to wait! Absolutely amazing. I know this sounds like a rant, but good or even mediocre service can go a long way in providing a satisfactory dining experience. One poor (or many in this case) experience can ultimately damage any good will the place as brought with its dishes. Which unfortunately, in this situation it did not generate any. To top everything off in our visit to Gourmet Girl, they misplaced our entire order when paying. So having to repeat ourselves of what we ordered, we were questioned on our one coffee. In which, the staff leaned over the counter to check the number of cups on our table. You know, that coffee we ordered while having to wait. That one. Served by three staff during our time there, none was positive and that’s not a good sign. Gourmet Girl certainly is a popular place but I’m unsure if its as a result of desperation for a decent coffee around these parts or if my situation was out of the ordinary. Overall, I cannot overlook the poor service over the sub-standard food served. It would be dishonest of me to recommend this place to someone, but I do hope that if you do dine here that your experience is wonderful and pleasant and unlike mine. I do although prefer Red Cup Cafe which is minutes away by car over Gourmet Girl (both in service and quality of food). 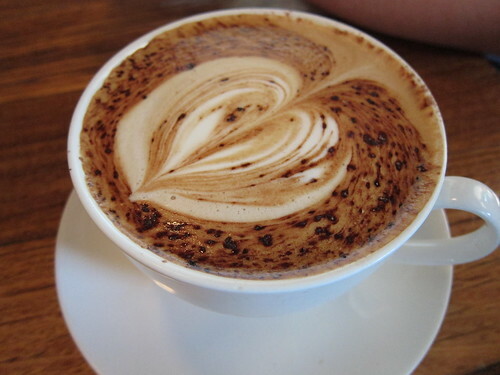 If you’re ever travelling on Whitehorse Road in Box Hill, you may come across Red Cup Cafe, brimming with people on the weekends no matter how early or late there is certain to be filled with locals. Red Cup Cafe offers your typical dishes that you would find in any other cafe but it’s not what kind of food that matters, it’s the taste. 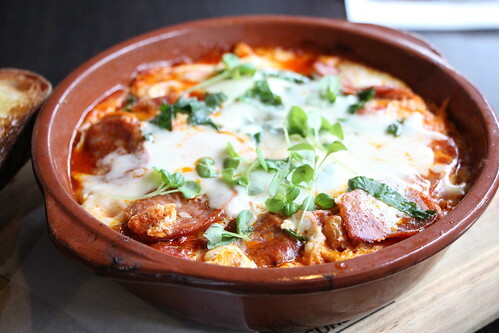 One of their offerings is the Baked Eggs with Chorizo, Tomatoes, Cheese and Spinach (shown above) and it’s an absolute stunner. The dish pan comes out straight from the oven with the cheese golden in colour. Mixed in with this is the spinach, tomatoes and the chorizos, served with a Spanish styled chilli sauce and toasted sourdough bread. The spiciness of the chorizo opens up the palette and complements everything extremely well and with just the right amount of sauce from the tomatoes at the bottom of the pan. Nothing to fault. 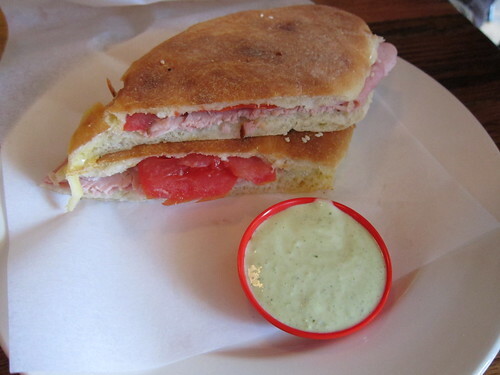 Their Ham and Tomato Sandwich with Mayonnaise isn’t quite the looker and nor is it anything special, unfortunately. I would say it needs sauce or dressing and although the mayonnaise is supposed to fill that role, I find the mayonnaise too overpowering and too rich to be consumed with the sandwich. Some may prefer the tomatoes still to be cold even after the sandwich is toasted but I’m not one of those people. It’s a decent dish but not one you would solely come back for. 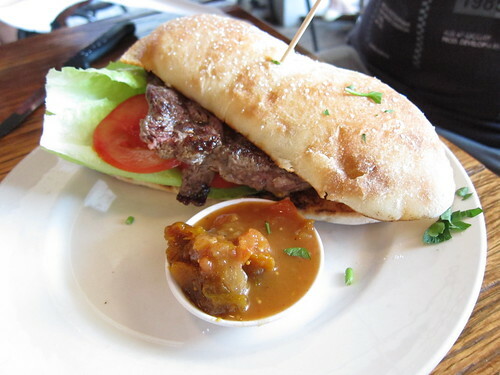 Red Cup Cafe’s Steak Sandwich with chutney is also a slight disappointment. The centrepiece of the dish is supposed to be the steak and here the cut of meat chosen makes a poor filling for a sandwich. The reason being as the beef is extremely chewy, difficult to slice apart and lacks in any sort of seasoning whether that be pepper or salt. The chutney I find does not complement the sandwich at all, having a sweet and sour flavour to it that is jarring to the steak and salad within. A letdown of gargantuan proportions. Customers coming to Red Cup Cafe wouldn’t come back if the coffee wasn’t any good and the coffee here is one of the better offerings I’ve found around these parts (Gourmet Girl’s coffee in Blackburn does not even come close) At Red Cup Cafe they offer a Seriously large cup, which is made for two or maybe one that desires a significant coffee hit. Red Cup is a bit of a mixed bag. Their Baked Eggs is probably one of the better versions I’ve come across and yet their sandwiches do not meet the same standard. Luckily the coffee is good or otherwise I wouldn’t give this place a second look. 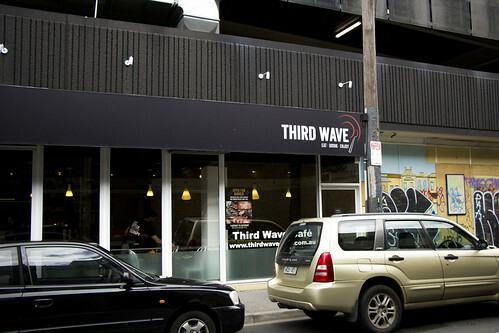 Third Wave Cafe in Prahran is the sister cafe to their first cafe/restaurant in Port Melbourne. 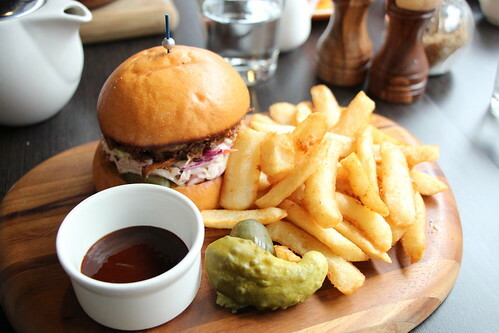 The Port Melbourne location specialises in American BBQ, and that also carries over to the Prahran restaurant. Third Wave Cafe Prahran mostly does breakfast/brunch/lunch but from Thursday to Saturday they do open their doors for dinner. The chef is Ryo Kitahara who is the protégé of Iron Chef Sakai, which I must admit is pretty special. I was a big fan of the Iron Chef series. Their location might be easy to miss if you don’t know where you’re going, Google Maps took me into the other direction! 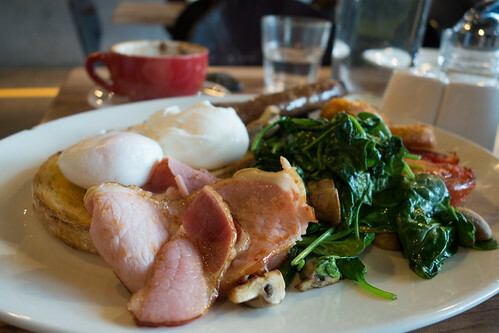 It’s located across from a gym (could be an after gym workout meal), on the side of the Woolies and close by to the Prahran Market on Cato Street. I was invited here by Third Wave Cafe to try their menu and I thank them for the opportunity. 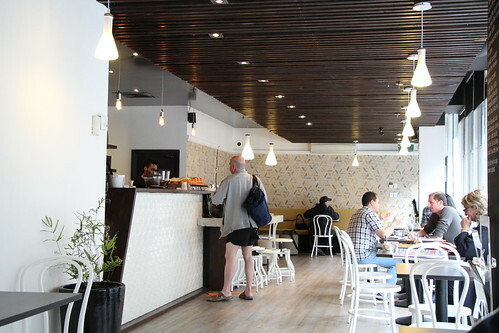 It isn’t your typically cafe in the sense that it lacks outdoor dining but it’s such a pleasant atmosphere it isn’t missed at all. They have a bar stools area as well as your standard dining setting with plenty of lighting. Their menu is diverse and you may find it difficult to finally decide on what to order. Having gone for brunch/lunch we ordered a couple of different dishes to try. Third Wave’s Pulled Pork Slider with fries tastes as good as it looks. 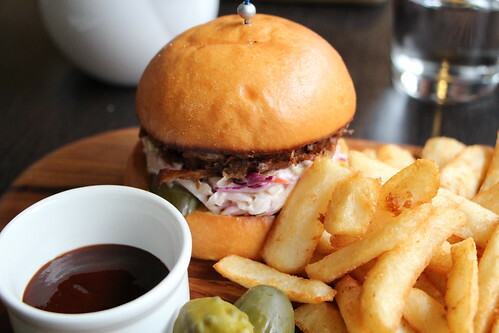 The burger itself contains the pulled pork, with pickled cucumber and fresh coleslaw and their own BBQ sauce. The just cooked pork is seasoned well (and not too salty), adding a bit of the spicy BBQ sauce it complements the slider well. The cold coleslaw in a burger is something I’ve often not tried but here it makes for an interesting combination and certainly feels fresh. The coleslaw itself is light and not too rich in its use of mayonnaise. The fries are also light and crispy, and not heavy in its use of oil. A very pleasant surprise on how well everything was cooked, without feeling guilty over eating a burger with fries. One of Third Wave’s specials is their Texan Fry Up and just maybe one of my favourite dishes ever, really no joke. The slow cooked smoked brisket is the highlight of this dish. It is just simply cooked to perfection. The smokey brisket practically teleports you to an American Steakhouse. It’s most definitely the best meat I’ve ever tasted. Tender and flavourful. 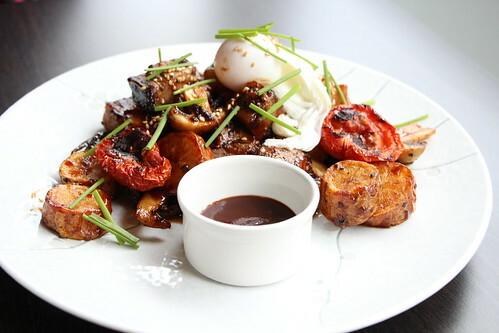 The mushrooms, potatoes, tomatoes all complement the star of the dish and with a small amount of the spicy BBQ sauce it is just simply delicious. The poached egg oozes yolk although the outer most part of the yolk is hard boiled. Overall, it really makes me want to try their dinner menu because this dish is cooked so well here. On a side note: this dish was oddly on the breakfast page of their menu under specials, but it seems more like a lunch item to me. 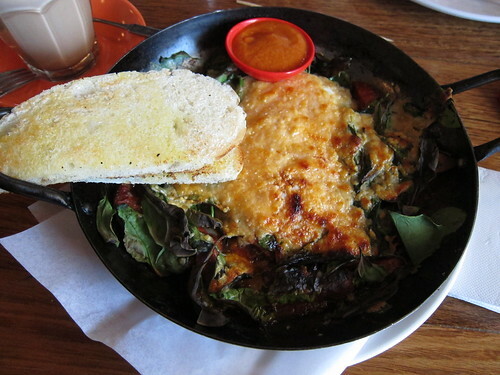 Their Spicy Ratatouille Baked Eggs also looks as good as it tastes. 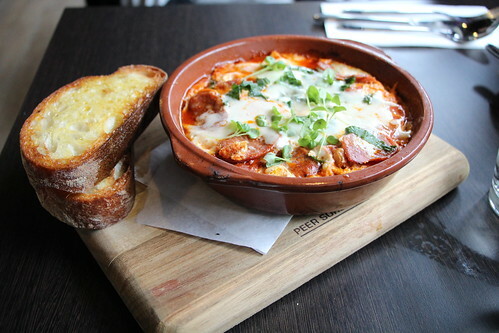 I’ve actually only recently tried a similar dish at Red Cup Cafe in Box Hill, both are similar in the ingredients they use and both I say are more than satisfying. The Spanish Chorizos add the spiciness to the dish, and with the addition of zucchini, eggplant, red peppers, tomatoes and of course eggs topped with Asiago cheese is another winner. Served with toasted Ciabatta bread it is one of those feel good warm dishes that I can see myself eating on a cold morning. The saltiness of the dish comes from the chorizo’s and it could be too much for some but eating this injunction with the crunchy bread and baked vegetables I couldn’t be happier with the meal. 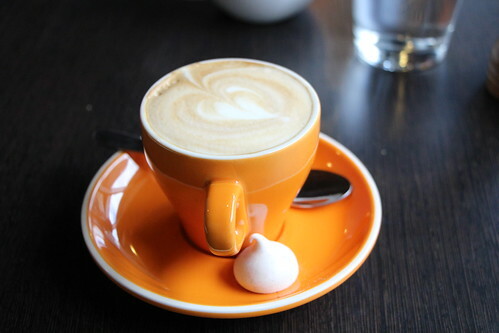 From my understanding, their hot drinks come with this bite sized mini meringue that has this surprising ginger and possibly cinnamon flavour. Eating this with your coffee, you may even find yourself thinking you just ordered a Chai Latte. Their Latte is light and not too intense. I usually prefer much richer, fuller coffee with not too much foam on top. This isn’t the case here but it is in no way bad, just a decent cup of coffee. Third Wave Cafe definitely impresses with their selection of dishes and the quality of the dishes as well. I really cannot recommend enough the Texan Fry Up and to a lesser extent their Spicy Ratatouille Baked Eggs and with Third Wave Cafe’s Sweets, Paninis, Russian Menu. I don’t think you’ll be bored by the menu anytime soon. Whenever I go back to Prahran, a visit to Third Wave Cafe is on order.